Many years ago, when I was a student at Catholic University in Washington, D.C., I once went to a church near the campus and had a conversation with one of the priests inside the chapel. He gave me a book about the life of Jesus Christ. I was deeply touched by the sacrifice that Jesus had made for the sake of others; I learned that man should stand up for a right cause, even if it means his death. That encounter triggered a change in my life, and I came to see myself in a new light. I cherished the freedom of speech and democratic values rooted in the Constitution of the United States. I had always dreamed of my people in Iran living in similar circumstances. The insight on the life of Jesus made me realize that I could do much more to make that dream come true. That was what set me on the course that led to Camp Ashraf, Iraq, where thousands of freedom fighters had dedicated their lives to the establishment of freedom and democracy in Iran. We aimed at restoring human rights to the people of Iran. Years later, we became victims of human rights abuse ourselves, and I found myself treading a much more complicated path for the realization of freedom and democracy. In 2009, the United States government — responsible for our safety and protection — decided to hand over the security of the camp to Iraqi forces. We collectively objected, warning the U.S. that by making this decision, we would be put in harm’s way, for Nouri al-Maliki follows the orders of the mullahs’ regime, and will massacre us. Since that time, five attacks by Iraqi forces that led to the deaths of 112 Ashraf residents have shown the correctness of that claim. The U.S. government had legal and moral obligations to protect the residents of Camps Ashraf and Liberty under the Fourth Geneva Convention. This was a mutual agreement between Camp Ashraf residents and the U.S. government. I was surprised to see the U.S. government condemn the attacks without taking any measures to stop them. What happened to the U.S. commitment to protect us? On Sept. 1, Maliki’s forces staged another attack in Camp Ashraf, killing 52 and abducting seven others, six of them women. Two of my best friends, Hossein Madani and Bijan Mirzaii, both graduates of U.S. universities, were among the victims. They were in Ashraf based on a quadripartite agreement among Iraqis, the U.S., U.N. and PMOI (the People’s Mujahedin of Iran). The Iraqi government breached this agreement by attacking the camp. Again, the U.S. government condemned, but did nothing else to free the hostages or to secure the remaining residents of Camp Liberty. This endless string of broken promises on the part of the U.S. government left us with one last option: We decided to go on a hunger strike Sept. 1 to have our voices heard and bring attention to our critical situation. After being on hunger strike for nearly two months, I can either quit or continue. But I learned from Jesus to stand for the right cause, regardless of the consequences. There are other lessons to be learned from history. The Romans didn’t stand with Jesus at the time of his crucifixion, and they turned their backs on him, something they later regretted. Will history repeat itself? Will it take the death of the seven hostages and all of Camp Liberty residents to bring the U.S. government to its senses? There is another way. Before giving Maliki any more assistance, President Barack Obama must put pressure on him to free the seven hostages. I am sickened that Maliki was invited to the White House without being held accountable for five deadly attacks against Ashraf and Liberty. Unless the U.S. puts severe conditions on any new aid, including freedom and protection for those at Camp Liberty, all our deaths in Iraq will have been in vain. President Obama, never forget: You are responsible for the safety of the seven hostages and Camp Liberty residents. Ali Akhavan received his bachelor’s degree from Catholic University in Washington, D.C., and finished his master’s at Virginia Tech in civil engineering. 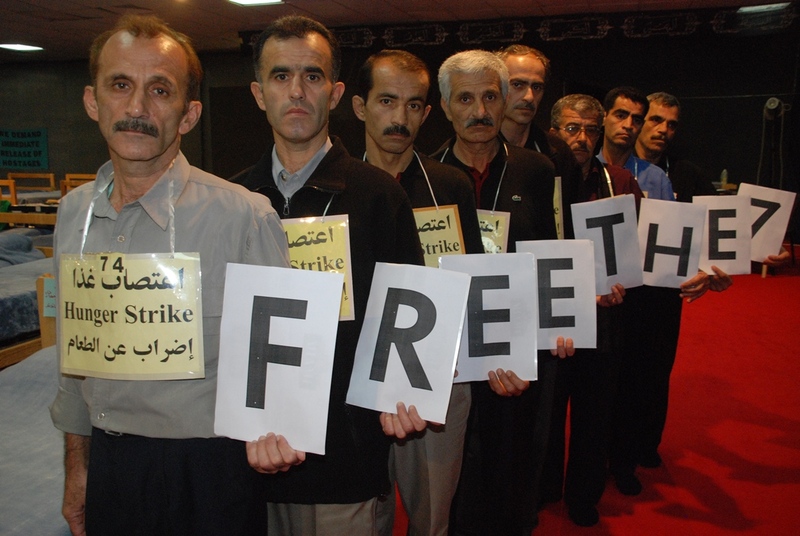 He resides in Camp Liberty and has been on hunger strike since Sept. 1.